When Divers Get “The Bends”, It’s Triggered By A Buildup Of? In 18th Century England Hot Drinks Made From What Substance Were A Popular Coffee Alternative? “The bends” or, formally Decompression Sickness (DCS), is a condition that primarily affects divers but can also affect anyone moving between environments with different pressures such as those flying in an unpressurized aircraft or returning to a pressurized spacecraft after exposure to the vacuum of space. The condition is the result of dissolved gases, primarily nitrogen, coming out of solution and forming bubbles inside the body as a result of depressurization. Because the body is filled with gases in solution and “when and where” the shift in pressure will cause gas bubbles to form, the actual symptoms of decompression sickness are difficult to predict, but can range from mild discomfort in the joints to catastrophic embolisms in the blood stream that result in death. The symptoms can manifest as cutaneous (itching of the skin, discoloration), musculoskeletal (dull to sharp pain in the joints), and neurological (altered sensory perception, memory loss, and paralysis in the legs), among other symptoms dependent on the location of the bubble manifestation. 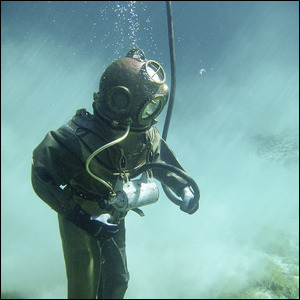 Thanks to extensive study in the 20th century and the resulting protocols for preventing decompression sickness, however, divers, pilots, and others who would, historically, be highly predisposed to experiencing “the bends” at some point, can now work in safety and without fear of injury via decompression sickness.